Younes Kaboul completed an amazing comeback by Tottenham as they fought back from 4-1 down to hold Aston Villa. Dimitar Berbatov nodded Spurs in front but Martin Laursen levelled after Paul Robinson's error, then made it 2-1 when he deflected in Zat Knight's header. Gabriel Agbonlahor drilled home a third and Craig Gardner's low free-kick made it 4-1 before Pascal Chimbonda replied after Jermain Defoe had hit the post. Robbie Keane's penalty made it 4-3 before Kaboul's last-gasp leveller. Tottenham remain in the bottom three of the Premier League but their under-fire boss Martin Jol can take heart from the way his side responded when facing almost certain defeat. But while the manner in which the home side earned their point will ease the pressure on Jol, he will know he must solve the defensive problems which meant they had to work so hard to get something from this game. Why do Villa draw so many games? Why can't we hold on to a win? Spurs had celebrated their 125th anniversary with a parade of legends before kick-off but the party did not continue for long once the game was underway. True, Jol's side were looking dangerous going forward but Tottenham's continuing difficulty in dealing with Villa's attacks meant that, just two minutes after Berbatov rose to nod the home side ahead, the visitors were level. Robinson inexplicably dropped Gareth Barry's corner and the ball bounced kindly for Laursen, who smashed his shot into the unguarded net. Villa's second goal was almost as embarrassing for the Tottenham defence, a quick free-kick catching them unawares and, from another Barry cross, Knight headed the ball against Laursen, through Robinson's legs and into the net. Things got even worse for Spurs before the break when Gabriel Agbonlahor latched on to a clearance from Villa keeper Scott Carson, held off Michael Dawson and fired into the bottom corner. And when Robinson failed to keep out Craig Gardner's low free-kick early in the second half, things looked ominous for Spurs and for Jol. But Tottenham never gave up and, with Defoe brought off the bench, they belatedly began to threaten again. The England striker hit the post before Chimbonda netted from the rebound to give his side hope, then Robbie Keane brought the score back to 4-3 from the spot after Marlon Harewood clumsily fouled substitute Darren Bent. It still looked like Villa would hold on but Kaboul had other ideas, slamming home in stoppage time after Villa failed to clear a corner. Tottenham: Robinson, Chimbonda, Dawson, Kaboul, Bale, Lennon (Malbranque 86), Zokora, Huddlestone, Tainio (Defoe 54), Berbatov (Bent 73), Keane. Subs Not Used: Cerny, Rocha. Goals: Berbatov 20, Chimbonda 69, Keane 82 pen, Kaboul 90. 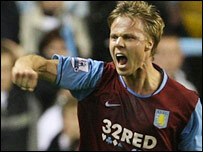 Aston Villa: Carson, Mellberg, Knight, Laursen, Bouma, Gardner (Petrov 73), Reo-Coker, Barry, Young, Moore (Harewood 66), Agbonlahor. Subs Not Used: Taylor, Davies, Osbourne. Goals: Laursen 22, 33, Agbonlahor 40, Gardner 59.